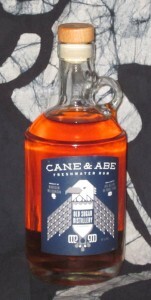 Cane&Abe is a rum that just dares to be different. Its bottle, what with the loop on its neck, looks more appropriate to moonshine than rum. The native-american style eagle on the label, again, doesn’t exactly screech of high seas adventure. And being made in Madison, Wisconsin; arguably the LEAST piratey city in the entire US of A? Now my mind is blown. On the tongue, Cane&Abe is again like hot butterscotch – liquid candy for adults. Light and sweet, this isn’t exactly fit for putting a kraken into a half-nelson while making out with a mermaid and kicking a spanish corpse. But while it’s not the stuff of pirate legend, it IS pretty decent in its own right, and might be worth checking out if you’d like a break from charred gunpowder and molasses.